In case you haven’t heard, there’s a battle brewin’ on The Plains. And whooooo boy, it’s a dandy. 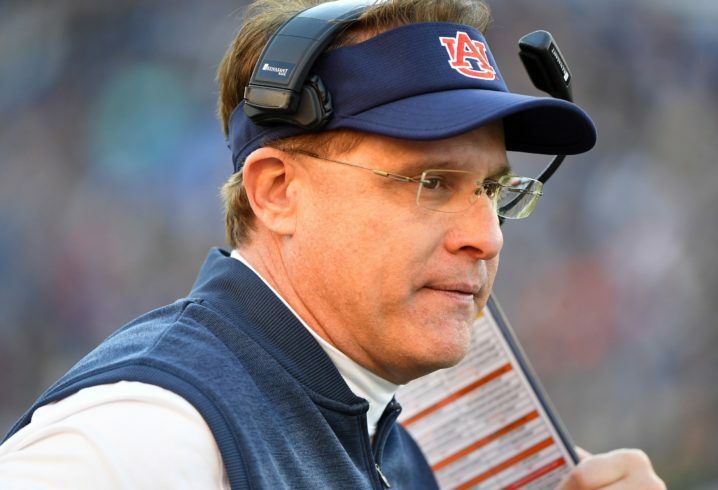 The 4-man quarterback battle at Auburn could make or break Gus Malzahn’s future, and Saturday provided some insight as to what direction he’ll go in to replace Jarrett Stidham. Will he get bold and roll with the true freshman Bo Nix? Or perhaps he’ll go with experience and start someone like Malik Willis? We don’t have an answer to that yet. In all likelihood, Malzahn won’t go public with his quarterback decision until days before the opener against Oregon. But that doesn’t mean he’s lacking a pecking order. 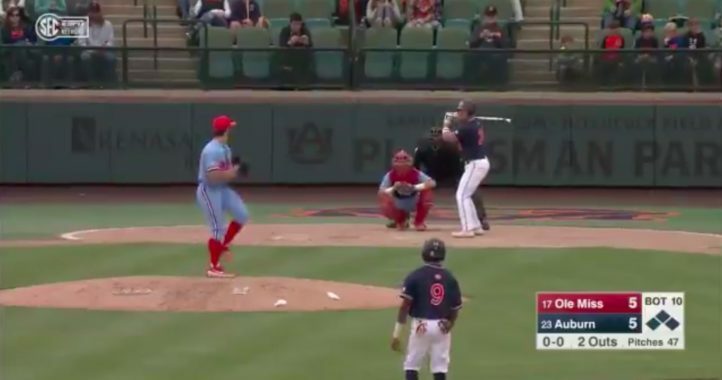 It’s not that Sandberg lacks the ability to execute Malzahn’s offense. It’s that Malzahn doesn’t look like he has the confidence in Sandberg that he does with the rest of Auburn’s quarterbacks. At least when it comes to throwing the ball downfield. Part of that could be because Sandberg has a long delivery. The other part of it could be that it was difficult for Sandberg to do a whole lot with Derrick Brown in his grill all afternoon. Whatever the case, Sandberg seems like he’s the furthest away from winning the starting job. He trails in experience, upside and just the basic understanding of the system. Could he execute if called upon? Probably, but Sandberg makes Auburn a relatively predictable offense. If and when Malzahn releases a depth chart, I’d expect Sandberg to have a steep climb. I’ll be honest. I was super impressed with Gatewood. That was a year after I wrote about how overhyped he was and that the Cam Newton talk needed to be silenced. It seemed like Gatewood made it a point to show off his arm. He looked much more calm, cool and collected as a passer. There wasn’t a giddiness in his throws. Gatewood’s trust with Seth Williams was evident. Twice Gatewood threw it to him in double coverage in the end zone, and twice Williams came down with it. Sure, Williams made a play on the ball and he’ll get the praise, but it had to be assuring to Malzahn to see Gatewood actually have that chemistry. Gatewood also had a nice connection with Eli Stove, who caught the first pass of the day. In a game like that where quarterbacks are non-contact, it’s hard to evaluate someone like Gatewood in his full capacity. He had a run on the first drive that he made a man miss at the line of scrimmage and he would’ve gotten to the second level with a head of steam in Newton-like fashion. I bet Gatewood is the exact reason why Malzahn had his quarterbacks live in a scrimmage a couple weeks ago. So why would Gatewood only be tied for second on the depth chart? 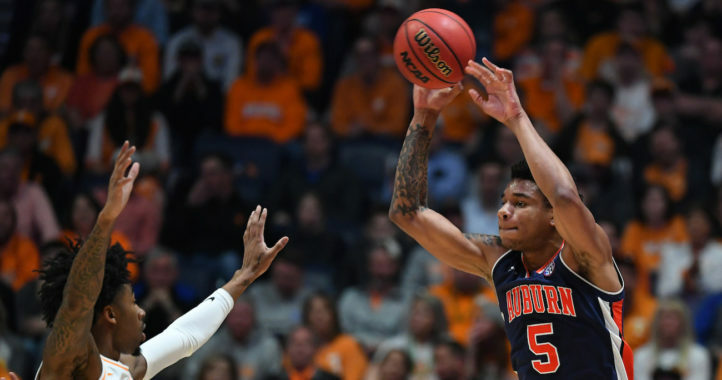 The accuracy was definitely improved from a year ago — we heard that from reports during Gatewood’s redshirt year — but it still wasn’t completely polished to make him the front-runner. And while Gatewood’s touchdown passes were the product of him trusting Williams, I’m not sure if he’d get away with those throws against the first-team defense. Having said that, Gatewood is absolutely in the hunt to win this job. I thought Saturday trimmed the field from 4 guys to 3. I’m higher on him than I’ve ever been, and Auburn fans should be, too. I know, I know. You, excited Auburn fan, were hoping that I was going to have the 5-star true freshman at No. 1 on this list. You wanted to go all in on Nix as the favorite to win the starting job after watching him play beyond his years on Saturday. But let’s pump the breaks a touch. I have him tied with Gatewood — and not as the favorite — for a couple reasons. One of those being that yes, while Nix showed some incredible poise making a variety of throws both inside and outside the pocket, Malzahn was helping him through checks and alignment. It’s also worth noting that Nix was facing a second-team defense in the first half — when he did most of his damage — that was throwing vanilla packages at him. It’s a totally different ballgame when you’re having to make reads against SEC defenses with blitzes coming from all over the place on third down. In Nix ready for that yet? Maybe, but I think Malzahn would prefer to ease him into that instead of putting all his eggs in that basket already. Don’t get me wrong. Nix absolutely looked the part on Saturday. He keeps his eyes downfield and doesn’t panic like most true freshmen do. I have no problem with Auburn fans labeling him “the future.” He’ll have a chance to show Malzahn that he can be the guy from the jump. But if I’m placing a bet today, he still trails Willis after what we saw on Saturday. If I’m an Auburn fan, I’m comfortable with the idea of Willis being the starter. Saturday showed me more from his arm than I expected. That was important because in a non-live situation, Willis wasn’t really going to be able to use his legs to set himself apart. Willis, Gatewood and Nix all really avoided the “first read and run” habit that dual-threat quarterbacks fall into. Maybe it was the confidence of knowing that they weren’t going to be hit, but I thought all 3 did a solid job of letting plays develop and going through their progressions. But as of right now, Willis should have the slight edge. I’d be lying if I said Auburn’s schedule — 7 opponents are ranked in the top 16 of FPI — and Willis’ experience weren’t a factor in that. There’s nothing wrong with that, in my opinion. Willis doesn’t have the upside of Nix or Gatewood. Saturday was a reminder of that. But Malzahn isn’t necessarily looking for the quarterback who can make the superstar plays. As he repeated to SEC Network’s Lauren Sisler, Malzahn is looking for the guy who can make reads and execute the offense. It’ll be about establishing the run game and having a quarterback who can make throws outside of the pocket. That’s what he wants to get back to with full control of play-calling duties. Right now, Willis is the most likely bet to be under center against Oregon in a few months. Willis is just about as experienced in playing college ball as all three of the other QBs on the roster. I don’t think he has over 20 career pass attempts. While I don’t doubt he is definitely still in contention for the job, arguing that he has the edge because of his ‘experience’ is fairly weak. I have no idea what Gus is going to do at the position, but I would be surprised if Willis is the starter a few weeks into the season. He seems more limited than the other two contenders. Auburn needs a QB that can make plays, not just be some sort of game manager. That being said, I would be fine with Willis as the starter when Auburn goes to LSU. Either way one of them is making a road start as an inexperienced qb in tiger stadium.. hope they all bring extra pants! Regardless of who starts vs Oregon, expect both Gatewood & Nix to share reps. Same in week 2 vs Tulane. Gus doesn’t want to run a “platoon” system long term; but those first two games allow him to evaluate and select a starter – and give both QBs valuable reps should injury or poor play require a change later in the season. My God, you’re such a hack..It’s Gatewood or Nix. Doesn’t part of the QB executing his offense involve the QB running the ball? Seems like he’d be looking for a QB that can be a dual threat in his make-or-break year. No a QB doesn’t have to be able to run the ball in his offense.. True, they just have to be able to run the ball in his offense if they want to be any good. Wrong again. Please go look at Malzahn as an OC and his stats. Everyone wants to point to the Cam and Marshall years. He has had success when his QB hasn’t had to run. 2016 Auburn ranked #9 going into UGA game and white got hurt and couldn’t throw due to his shoulder. Would have finished the year in top 10 if that doesn’t; happen. White was not a running QB.. I really encourage you to study up on his past. So you have 1 piece of ok evidence against 2 pieces of strong evidence? Convincing. That is why I said look it up but I guess I’ll have to do it for you.. When Malzahn was at Tulsa he was 3rd in the country in passing yards 42nd in rushing in his first year. His second year he was 9th in passing and 5th in rushing. His quarterbacks at Tulsa had 107 yards and 186 yards respectively in two seasons. In 2006 at Arkansas, they were 108th in passing and 4th in rushing. Darren Mcfadden and Felix Jones were his running backs.. you might’ve heard of them. His quarterbacks that year had negative yardage rushing.. In 2012 as HC at Ark State they were 43rd in passing and 24th in rushing. His quarterback that year 438 yards. So no, his quarterbacks do not have to run for his offense to be successful. The keys for his offense to be successful is great line play and playing fast. It is no question he wants to run the ball but its been through solid line play and a capable back. All 4 qb’s are capable of running the ball. They also have to make make the right decisions on when to run or not. I’d imagine they aren’t all at the same level in all aspects of running. I honestly think Gatewood is the guy. I think Nix needs a year of learning, but he is close. Both can sling it. Both can scramble. Gatewood is obviously the bigger QB. Can’t judge decision making until we see them play meaningful minutes. Improved OL and run game should take some pressure off the QB. Guess this guy didn’t watch any of the game? That would be an accurate assumption. Seeing how Gatewood and Nix were playing with the 1s and Sandberg and Willis were playing with the 2s. There’s obvious separation from everyone that’s seen an Auburn scrimmage this year.